I've been working on this project for quite some time now and its finally here! ; The collaboration between artists STARKS! 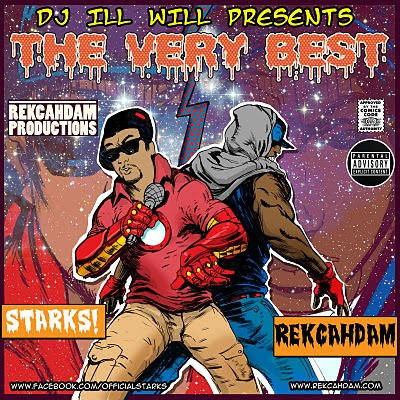 , Rekcahdam (Me) and DJ Ill WIll to bring you "The Very Best" Mixtape! You can download it here! We feature one of the best MCs I've ever heard; Prince Ea on the second track, "The Cypher", and we continue to bring the heat for the rest of the mixtape! Everything you hear from this mixtape was record in an apartment, produced by either STARKS! or myself and carefully engineered by myself. If you've been fiending for some "real hiphop" its finally here! Check it out! EDIT: You can download the untagged version here! Wow. I listen to a lot of hip hop and this has stood strong against any industry artist. Dope beats with inspired lyrics. Please keep it up! I've been on this mixtape since its drop and will continue to push it hard. Respect. Thanks man! I really appreciate it. Yeah I will continue to keep the true hiphop movement strong man! All I can say is holy $h!t. I've listened to the mixtape three times already, once on my way to work, once on the way back home, and after I got home and got blazed. This was one of the dopest mixtapes I've ever heard, let alone better than most rappers albums, not a single song let me down. I was curious, is there a write-up of the lyrics for all the tracks on the mixtape? Thanks man! I'm glad you enjoyed it! Keep rockin it and letting people know about it! Right now theres no write-up of the lyrics but give me some time and I'll put one together and post a link to it on this thread! Thanks Again! So any one and everyone I bumped into today, while listening to the very best mixtape ever, said they were completely blown away by your beats and your flow. I've sent a couple people to your blog already so they could get a better listen. I was wondering where I could find some more of your tracks, even if it's not "the very best" i'm sure it's better that most the rest. There are actually a few songs that didn't make it on the mixtape. I actually like these tracks a lot but I felt that they were a bit too "out there" for the mixtape haha. THE BEST mix-tape I have heard in a long time. The beats are insane, with sick samples in em'. Very creative and lyrically amazing. After I finished listening to the WHOLE thing. It only made me hope that you guys keep doing what you do and put out more music for people to enjoy. So basically, thank you for the music. :] From: Orlando, FL - Omar. I loved the whole tape. keep producing man!